If we are going to find satisfaction just on a few rejection that the NLD has done during its nearly two years in power, it is still far away from its election campaign promise of "time for change". NLD leader, Aung San Suu Kyi has paraphrased this campaign promise first to relabel it "together with the people" and now recently, during the first anniversary opening of State Counselor Office on July 27, by arguing that she in fact meant to say a change of heart to serve the people is needed in all to be able to reach peaceful reconciliation and establishment of a federal union. This looks like a desperate plea to the difficult, forced coalition partner, by virtue of the 2008 military-drafted constitution that holds more power without having to go through the election process than the elected NLD regime, to be more accommodative on peace negotiation process and establishment of a genuine federal union system of governance. It will be fatal if Suu Kyi would just wait for the good will change of the difficult coalition partner to be able to deliver. She and her party sure would need some plausible strategy than just being resigned to the present situation with limited power and tactically being barred from calling the shots on issues like war and peace and the establishment of a genuine federalism. Otherwise, the NLD regime would never be able to deliver on its election campaign promises, much less maintain a longer presence that the people could rely on in political arena. 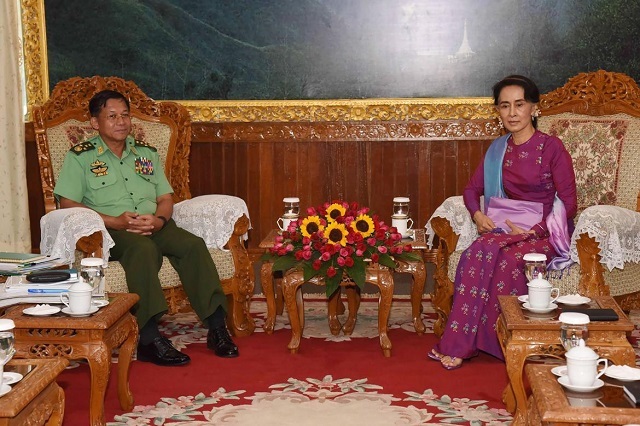 Link to the story: Is the NLD government acquiescing to the Tatmadaw?